Osteoarthritis develops as people get older and is present in almost everyone over the age of 60 (although not everyone in this age group has symptoms). Osteoarthritis of the knee or hip may occur in younger people, usually (but not always) because these joints have been overloaded. Possible causes of overloading include sports, jobs involving a lot of lifting and carrying, too much body weight and abnormal joint development. Osteoarthritis occurs in the joints of the body that are classified as “synovial”. A synovial joint is one in which the ends of the bones are enclosed in a capsule containing a thick, slippery liquid called synovial fluid. 1. It keeps the bones slightly apart, protecting their cartilage coverings from wear and tear. 2. It acts as a shock absorber, again protecting the cartilage. 3. It lubricates the joint. 4. It acts as a filter, letting nutrients reach the cartilage but blocking the passage of harmful cells and substances. The most important component of synovial fluid is a substance called hyaluronic acid. It is this that allows the synovial fluid to perform all its functions at the same time. The hyaluronic acid in synovial fluid does not stay there for a whole lifetime but is continuously broken down and replaced. Normally, there is an exact balance between the breakdown of old hyaluronic acid and the production of new hyaluronic acid. In osteoarthritis, however, this balance is disturbed and breakdown happens faster than production. As a result, the synovial fluid becomes more watery and stops working properly. Due to the change in the synovial fluid- and for other, more complex reasons- the cartilage in the joint gradually wears away. In some places, in fact, the cartilage may eventually disappear altogether. The thinning of the synovial fluid and wearing away of the cartilage lead to the symptoms of osteoarthritis, which includes pain, stiffness and swelling. We use Ostenil Products, Monovisc and Cingal. What is it, how does it work, and how long does it last? These medications are a solution containing hyaluronic acid. 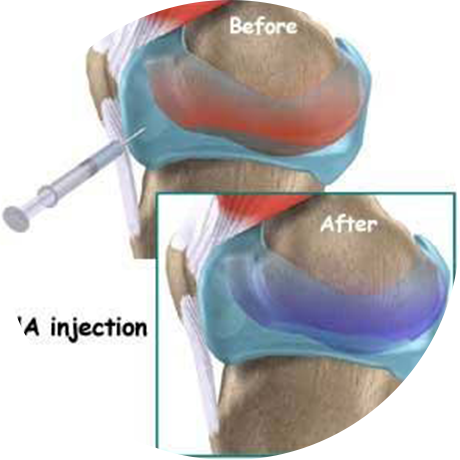 They can be injected into the space in the joint that contains synovial fluid and work by restoring the normal balance between the breakdown and production of hyaluronic acid. This effect means that it can decrease pain and stiffness and improve the other symptoms of osteoarthritis. The effect may last for 6 months to a year or more in some cases, but can be repeated at intervals indefinitely without any fear of toxicity or side effects. The hyaluronic acid is very pure and is manufactured using a process called fermentation. It contains no animal proteins, which means it is very unlikely to cause an allergic reaction. Viscosupplementation has been given to thousands of patients and has not been found to cause any serious side effects.